1. Frequent trading increases fees and reduces a client’s returns. This is a tangible fee. 2. Frequent trading reduces the quality and conviction of every decision. After all, why spend time thinking about a decision when you can just change your mind again in a few months? This is an intangible fee that clients don’t see directly but inevitably pay in one way or another. The first point is incredibly important for the long term returns a client can expect to achieve. Research carried out by Jack Bogle, founder of Vanguard and chief evangelist of passive investing, showed that while the fees charged by ETFs are lower than fees charged by most actively managed funds, most investors in ETFs underperform. 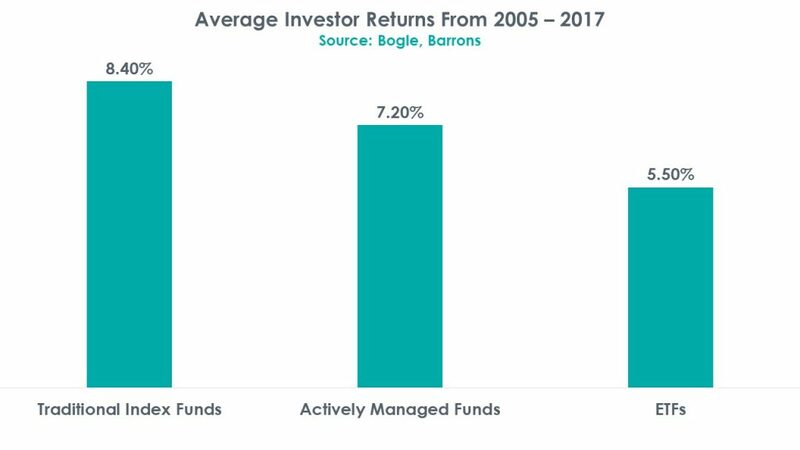 According to Bogle, the underperformance of ETFs arises from the ability to trade intraday, which is not possible in a traditional index fund or actively managed fund. This extra flexibility to trade intraday with an ETF influences investor behaviour and forces them to buy or sell with fervent frequency. This trading of course comes at a price through trading fees which act as a drag on investment returns. Just because you can trade frequently doesn’t mean you should. For more patient investors, the choice between an index tracker or an active fund may at first seem obvious. Index funds have in aggregate outperformed actively managed funds while demanding lower fees. This is expected because the average performance of actively managed funds will be equal to the broader market performance and an added layer of fees by an active manager will inevitably lead to lower returns than a simple index tracker. However, fund managers, just like CEOs, are not all created equal. William Thorndike’s book “The Outsiders” profiles 8 unconventional CEOs and their rational approach to success. Most of the CEOs profiled, with the exception of Warren Buffett, are not household names. Yet, their business record and the returns they created for shareholders trounces that of their peers. These CEOs all had one thing in common – they were excellent capital allocators. They didn’t try to grow at the fastest rate or have the largest market share. They were all intensely focused on increasing returns per unit of capital employed. This means that their tenure was filled with long periods of ‘inactivity’ with the occasional large acquisition. We have a similar approach at Tacit. A cheap ETF or index tracker is not necessarily better or worse than an active manager. What matters is the amount of return per unit of total fees. We are also wary of the intangible fees clients pay if we make more frequent but lower quality decisions. What is clear is that frequently trading accrues tangible and intangible fees which in the long term are a drag on investor returns.